Join the excitement and subscribe to Morgantown magazine, sister publication of the premier statewide lifestyle magazine, WV Living! 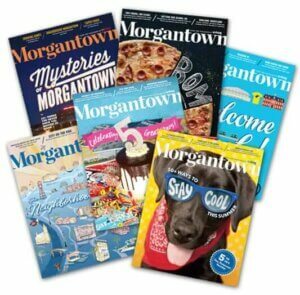 Available in print and digital editions, Morgantown magazine, published bi-monthly by New South Media, Inc., is the premier lifestyle magazine that celebrates West Virginia’s fastest growing city—home to West Virginia University. From neighborhoods to music to food to football, we will keep you in the know about what’s going on, who’s doing what, and where you need to be. Whether you are relocating or a lifelong native or an incoming freshman, Morgantown is your go-to resource. Looking to give a gift? Most West Virginians have ties to Morgantown, which makes Morgantown the perfect gift for everyone—WVU alumni, students, parents, and natives. So treat yourself and your loved ones to the only magazine that will keep you in the know. With each gift subscription, we will send a beautiful note announcing your gifts. Subscribe now on our secured site and receive 6 issues of Morgantown magazine! Frequency of all magazines is subject to change without notice. Double issues may be published, which count as two issues. We reserve the right to substitute gifts of equal or greater value.